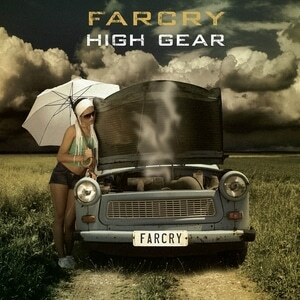 The members of FarCry have issued a track by track run down of each song on their recently released ‘High Gear’ album. The CD can be purchased at www.kivelrecords.com and sound samples can be heard at www.myspace.com/farcrytherockband. Love Wont Wait – This is a great toe tapper/fun summertime feelgood tune. Melodic goodness with a creamy center. Talk To Me – Pop, pop, POP goes the hit!!! Great sing along tune. Kinda Def Lep Adrenalize era. Have It All – Mean and in your face. This songs allows Pete to cut loose on the guitar and go nuts. This one has that early Winger vibe. Fine Line – Def Lep territory!! I can see people shouting this one at the top of their lungs. Kick Me Down – Kinda Firehouse meets Bon Jovi. Great vibe. This is a Clapper for sure. Heaven – The Ballad. The 80’s are alive and well in this one!!! Nowhere Fast – The “surprise” of the album!! A somewhat obscure Jim Steinman song. We will just say the clever/diehards of the genre will figure it out. This one came out ferocious and true to what it was meant to be. Honestly we thought John Kivel was nuts when he suggested us doing it. HA! Out Of Reach – Pop, pop, POP goes another hit. Great catchy singalong chorus that would make Bon Jovi proud. This one was meant for crowd participation! Penned by Jace Pawlak this one is a fave of all of ours. She’s Crazy – A great groove oriented party tune. With a BIG sing along chorus. Same Mistake – Another Jace penned tune, that simply put is a beautiful power ballad. The boy can paint a picture. This is one of his finest moments. HavingJace contribute to this album was both an honor and a pleasure. Look for HIS new band and album in spring of ’09 on a certain label. Those Were The Days – Upbeat… Anthem! Anthem! Anthem!! Bon Jovi “Slippery” era. If you haven’t kicked it into “High Gear” yet, head back out to our main profile page at www.myspace.com/farcrytherockband, and click the “Buy Now” link in the “About Us” section. What are you waiting for!! !